It’s almost hard to remember what the empty area in front of three buildings, located at 1, 55, and 99 Almaden Boulevard in Downtown San Jose, used to look like. That’s because today it has been transformed into an attractive and usable space, complete with drive aisle and outdoor amenities that appeal to tenants and passers-by alike. The metamorphosis was overseen by Toeniskoetter Construction, Inc. Designed by ARC TEC, Inc., the project’s main focal point is a curved drive aisle, which improves traffic flow as well as building access. The U-shaped drive has a paver finish and is surrounded by colorful and textured drought-tolerant landscaping. 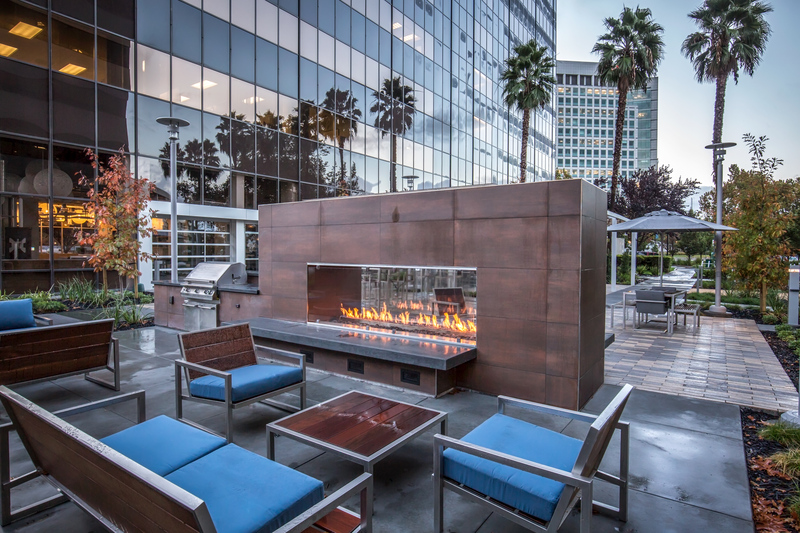 Building tenants also enjoy a new amenity space delineated in part by concrete walls clad with a tile finish. There is also a shade structure, built-in seating areas, a barbecue, outdoor fireplace, and new outdoor furnishings, all enhanced with custom lighting. The area is secured with new gates and fencing. As important as what catches the eye is what remains unseen. For example, Toeniskoetter built retention ponds for storm water treatment, which reduce storm run-off as well as acting as a biofilter. In addition, as part of the building permit process, the city required upgrades to accommodate its long-term goal of fiber optics improvements. That meant, in part, installing a sleeve in the existing conduit where fiber optics run to power city street lights. “Certainly, one of the challenges of this project was the number of underground utilities involved,” recalls Toeniskoetter Executive Vice President Adam Toeniskoetter. Because the work took place in a highly-trafficked, highly visible, prominent downtown location, extra effort was needed to keep the work site safe and clean.